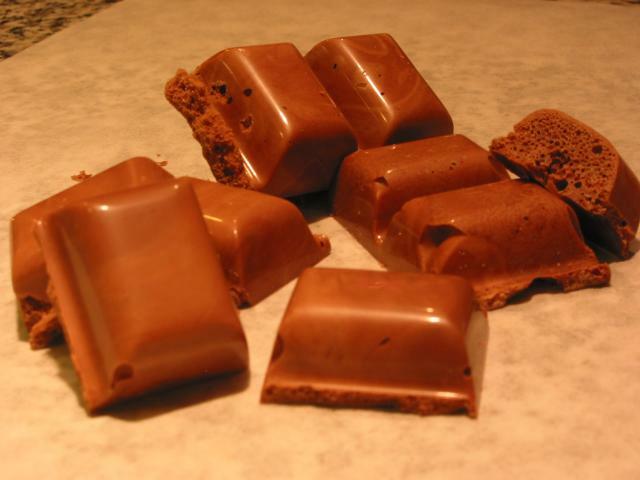 With apologies to those folks who feel that the Pastry and Baking forums are being taken over by candymakers I think it's time we started a thread on cooking from 'Chocolates and Confections'. I know at least two of us have the book now. I'm still just reading it through from cover to cover and the only thing I've tried so far is aerating some tempered milk chocolate in my cream siphon. Of course I didn't read the directions thoroughly and I only used one charge so I didn't get a lot of real bubbles in the chocolate. It did however lighten up the chocolate to a nice soft texture. I used some milk chocolate I had left over from dipping some cookies, I had added some orange oil to it. I used some easter egg plates that make about 6 large eggs. I poured a shell with milk chocolate then used the cream siphon to discharge the aerated chocolate into the molds. So I ended up with these nice big eggs, apparently solid chocolate, but the texture was light enough to bite into them without breaking your teeth. I'll try it next time with 2 or 3 charges and see if I can make aero bars. 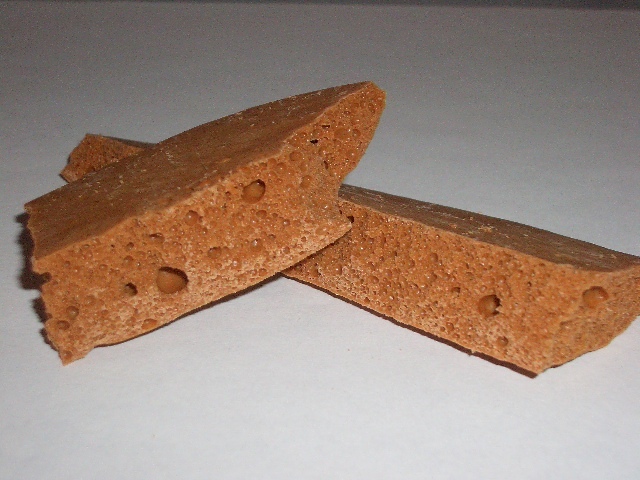 The one theory I need to test out is weather if I don't line the mold with chocolate and just discharge to contents of the siphon into a mold whether there will be bubbles on the surface of the mold or will it sort of form a smooth 'skin' like an aero bar has. i should be getting my copy in a week or so. the aero technique sounds like a very fun thing. i just recently bought an isi whip...so we'll check it out. I am courious to know how you got it soo fast? I will get my copy soon probably next week or so ( I preordered while ago ) and I am very very eger to put my hands on it . Is the siphon the one you use for whipping cream? Yes, plain old cream siphon. Tempered milk chocolate, add two or three charges of nitrous, shake for a minute or two and discharge. Then get the sucker taken apart and into hot water quick to clean it, otherwise you're never getting the chocolate out of the parts. !!!! Hubby bought me this book as a gift and it was supposed to arrive 2 weeks ago. He said he bought it from somewhere special so I could have it before the official release. It's NOT here. I wanna make aero chocolate and sleeping beauties. What are sleeping beauties? 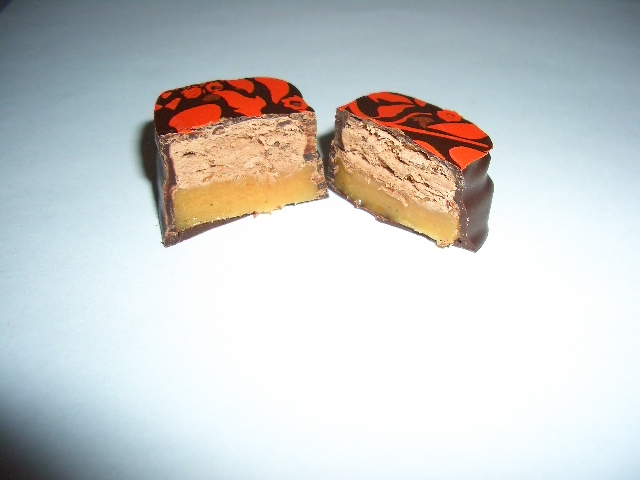 The Sleeping Beauties are a caramel base and then a chocolate nougat on top. Cut and then dipped into dark chocolate. I have to go out and do some work now (damn snow!) but I'll finish them this afternoon. is this book in imperial or metric...or both? And it gives the measurements as percentages! Ok, so the Aero Bar totally worked! I used 2 chargers, and didn't really shake for a full minute, I was panicking that it would harden in the canister so I wanted to get a move on. It worked really well and tastes awesome. I used Callebaut Java. I cut the rest into squares and am going to dip it. The cutting sort of squishes the bubbles on the sides and doesn't show very well, the broken pieces show the bubbles nicely. Now I'm wondering if it works on dark chocolate! I can't see any reason it wouldn't. Looking at the bottom of the bubbled chocolate - were there bubbles on the surface? The top of the chocolate wasn't bubbled. I was worried that it didn't foam very much because the top was solid, but once it set and I cut into it, there were lots of bubbles. I'm not sure about using it in a mold without lining it first, it probably would work. I think portioning it into small bon-bon molds would be hard, but a larger one might work well. wow now I'm even more excited to get my copy on Thursday. I did also just receive a copy of Making Artisan Chocolates tonight. Two new chocolate books in one week.... pretty much a great birthday. Oh and I'm going to visit the new chocolate factory in Seattle, Theo, on Thursday as well. A very Happy Birthday indeed. Thanks for building my excitement even more... this is a great thread! i like the texture of the chocolate, fun! i would probably paint the molds first, although you can see that in most parts, the chocolate became smooth and shiny inside the mold. there is swirling on the surface, but i don't think it is out of temper, it is just a result of it being aerated...but i won't know that until it sits for a while (maybe a day or two?). definitely want to try it with flavored chocolate. kerry, what kind of flavors did you use? lor-ann? WOW - I am amazed at what can be done to aerate the chocolate. It seems that Kerry's idea of filling the larger molds with something like this is really great especially since there shouldn't be an issue with shelf-life. I bet that just a quick painted layer in the molds would be perfect as you suggested, then you would have just the thinnest layer overtop of the bubbles. I buy oils from Xenex labs. They make excellent quality citrus oils. I also have some of the Lor-ann flavours for chocolate. I particularly like their Canadian Maple flavour. Choux, were you able to finish these? I am perhaps overly anxious as I am still searching for the "perfect" nougat recipe and these sound so intriguing. Ack! I lost my first post attempting to put the picture on, so here I go again. The Sleeping Beauties are very tasty, but the nougat didn't really cut very well. It has a bit of a 'stepped' appearance on the side. I think a guitar would be very handy for these. I did let them sit overnight before I cut them, so maybe cutting when they are fresher would help. 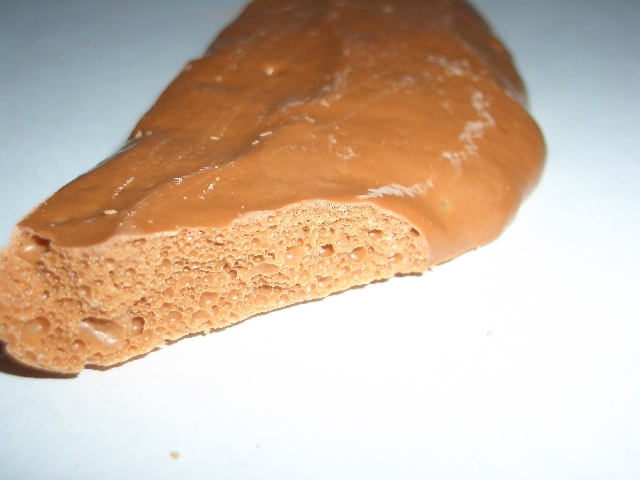 The chocolate nougat is really good, it has a texture like a 3 Muskateers bar, soft and dissolves in your mouth. Thank you, thank you! That nougat looks like it is much closer to the texture I am going after! Choux, those look like they taste amazing! I said it before when Kerry posted that she got her book last weekend, I am sooooo jealous! I really really want my book to come in the mail! Interesting thing I noted in the "ingredient function in brittle, toffee, and caramels", chef Greweling states that milk solids in caramels contribute to 'stand up quality' or resistance to cold flow. I wonder if this means that if we added some milk powder to our caramel recipe that we could create a caramel with less tendency to spread when cut? Excuse me, but I'm boggled on the entertaining possibilities of a pastry vs. confections militarization process (see first post). You got a croissant in my chocolate! No, you got chocolate in my croissant! The army of the confectioners is dressed in brown. The army of the pastry is dressed in either white or yellow, I'm not sure. The guns of the confectioners shoot enrobed chocolates. The guns of the pastry people shoot 1 tablespoon balls of cookie dough. Further reading in the confectionary part of this book makes me realize that I'm going to need one of those heat lamp things to keep the hard candy mallable while I'm manipulating it. Any thoughts as to a cheap source? Or could you just make your own with a halogen light? How warm do you think the heat source would need to be? One big selling point is the metric - it is always a big showstopper to have to convert to metric before getting stuck into a recipe - and it looks like a very cool book! OK Kerry and others who already have this book, you need to tell the rest of us what equipment we need to buy to use it! I see pictures of foamed chocolate and no specifics on the device. Now we need a sugar lamp too? We need to know this so we won't fall hopelessly behind in this thread by the time our copies of the book arrive!